Okay. I saw the new Star Wars movie. And I’m going to write about it now. Many spoilers ahead, but they’re needed for me to have an honest conversation. When I first saw Star Wars (A New Hope—which it wasn’t called yet) it changed my life. It was the first time I became a super-fan of something. I lived every day thinking about Star Wars, playing Star Wars, and drawing Star Wars stuff. I really learned how to draw because of Star Wars. “Extended Universe” is the common term for non-Lucas Movie Star Wars stories. I’ve been reading extended universe tales since they first began, with Marvel’s Star Wars #7, Splinter of the Mind’s Eye, and Han Solo at Star’s End. I even watched the Holiday Special. I’m not a huge nut about extended universe stuff, though. There are good and bad stories done by authors other than Lucas. But what I want to discuss here is stories that are follow-ups to Return of the Jedi. The post-Jedi extended universe stories I think work the best are the ones that have the heroes facing a new and different threat than they faced in the movies. The worst stories just try to bring back the Empire, rehash old ideas, and even bring in copy-cat villains including actual clones of old villains! That story has been told, and it ended. The best post-Jedi stories bring in new alien menaces, or mess up the status quo. The Yuuzhan Vong, or the Jedi/ Imperial Knights/Sith of Legacy are good examples of this. The Force Awakens chooses to recreate the Empire, including new versions of Vader, Palpatine, and Tarkin. The story itself is extremely derivative of the first movie. There’s very little new to see here. However, the new stuff is very good! The new good guys are excellent. Rey is an excellent character, perfectly played and developed. She’s another example of a sympathetic character (I discussed this on an old blog entry) who is an orphan. You see her struggle and feel for her when she triumphs or is in danger. She’s a survivor and a loner but is still excellent when she interacts with the rest of the cast. Finn is also excellent. It’s great to see a character that changes sides and he’s funny and believable. His best scenes are definitely with Rey and they have a great chemistry. Poe is a hotshot pilot and a dedicated soldier, but little else. BB-8 doesn’t do anything R2 couldn’t have done, so I was least impressed by him. The new bad guys are weak. As I said above they are just versions of old characters. But they aren’t very menacing or competent in their villainy. They get beat too easily, especially by Finn who doesn’t have any special powers except his knowledge as a former Stormtrooper. The new Emperor-type guy is goofy looking. The new Vader is weak and almost incompetent. The new Death Star is the ultimate power in the universe…but we’ve been down that road before. As I said before, using Empire-type bad guys doesn’t work well after Jedi. The Empire was a threat because they ruled the galaxy. The Rebels were the little guys standing up to the bully. Bringing back the Empire, even under a new name, makes them the underdog. You need a new type of threat to have a sense of impending doom that a desperate group of good guys must face. The old good guys showing up again went well I think. Ford is always good and Mayhew deserves a lot more credit than he gets for emoting so well under all that fur. I still have a crush on Carrie Fisher, and she played her role well, especially the emotional conversations with Han and her reaction when she feels him die. The best return of the original cast was Mark Hamill. I know he didn’t do much, but he looked amazing. Much more Jedi-like than I imagined! I guess I’ll end with one random comment. For a movie that was extremely derivative of the first film, there was one exception I didn’t like. 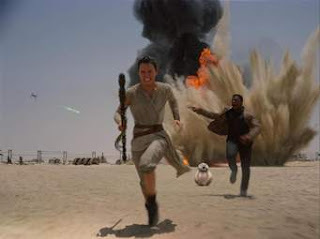 The original had early scenes with Luke on Tatooine that were filmed but left out of the final cut. Lucas liked the droids leading the viewers to Luke instead of having him introduced earlier. I would have liked TFA to have done this with Rey. The scenes of her life before she meets BB-8 do show us what she’s like, but I think the idea could have been incorporated into the story after she meets BB-8. It slows down the narrative too much, and I thought there were way too many slow spots in this movie. 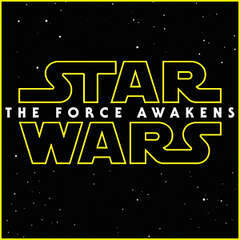 So, while I liked the movie, it isn’t nearly as good as the Lucas Star Wars movies. It’s not even as good as previous post-Jedi tales. But perhaps the next installment will be more original and better overall! I had a blast at Genghis Con this last Sunday. 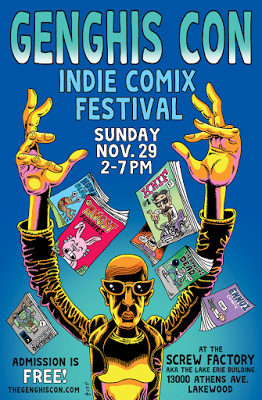 Genghis Con is a great little small press/underground comics show in Lakewood, Ohio. This was my second year with a table at this show, and I hope I get to do it again! The show is a great experience because of the other creators and the attendees that come through the hall. There is a feel of true camaraderie among the artists and writers who show their stuff at shows such as these. We are not people who make a living off the comics we are producing, but rather people putting our artistic souls into something we love! You won't see a variety of this scope at a mainstream comics event. This is where people go wild and end up with some downright fantastic stuff! The guests I talked to were a combination of fans of small press comics and first-time attendees wanting to check out what's available at the show. Everyone was super nice to me, and many expressed how impressed they were with the artistic endeavors they were seeing. Hopefully, they do a good job promoting the event and the artists they liked. who made a purchase at my table. It means a lot to me that someone is interested in my work, be it comics or related art, and interested enough to spend some of their hard-earned cash! I also picked up a couple comics while I was there, and I will be commenting on them here when I get through reading them!